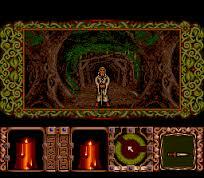 Obitus is a video game by Psygnosis, released in early 1991 for Amiga, Atari ST and DOS systems. It was also ported for the SNES, by Bullet-Proof Software. Ogre Battle: The March of the Black Queen (伝説のオウガバトル Densetsu no Ōga Batoru?, "Legendary Ogre Battle") is a 1993 real-time tactical role-playing video game directed by Yasumi Matsuno with artwork by Akihiko Yoshida. It is the first installment of an episodic series, and was originally developed by Quest. 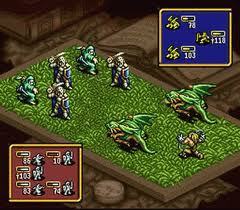 Originally released for the Super NES, it has since been released for the Sega Saturn, PlayStation, Virtual Console, and cell phones.It was followed up by a sequel in 1995, Tactics Ogre: Let Us Cling Together. Olympic Summer Games was the 16-bit edition of the official video game of the Atlanta 1996 Olympic Games. It is the third game of a loose "trilogy" also consisting of Olympic Gold and Winter Olympics. Overall, it was the last "Olympic" video game released for the fourth generation of consoles (Mega Drive and SNES), as well as the Game Boy.It follows the already common button mashing techniques of previous (and future) games, with the usual exceptions.It has 10 events (three more than Olympic Gold), but only two aren't based on track and field events, and unlike Winter Olympics, there are no major differences between each event on different platforms. On the Ball is an Action game, developed and published by Taito Corporation, which was released in Japan in 1992. Operation Europe: Path to Victory, released in Japan as Europa Sensen (ヨーロッパ戦線? ), is a combat strategy video game for multiple platforms where one or two players can compete in World War II action. The MS-DOS version of the game was only released to North America. Operation Logic Bomb, known in Japan as Ikari no Yōsai (怒りの要塞, "The Fortress of Fury"?) is a 1993 overhead action video game developed and published by Jaleco for the Super NES/Famicom. It was first released in Japan on April 23, 1993, and later in North America in September 1993. It is the second sequel to the Game Boy game Fortified Zone, following the Japan-only Game Boy sequel Ikari no Yōsai 2. Although the Japanese version shares the same title as the original Game Boy game, it isn't a remake. It was later re-released as BS Ikari no Yōsai on the Satellaview system. Operation Thunderbolt is a one- or two-player shooter arcade game by Taito made in 1988. It is the sequel to Operation Wolf. Like its predecessor, the game uses mounted positional guns as controllers. It also adds two-player simultaneous play. Versions of the game were released for the Super Nintendo Entertainment System and various home computers. An arcade exclusive sequel to Operation Thunderbolt was released in 1994, Operation Wolf 3. Oscar is a platform game that was released on Amiga 500, Amiga 1200, Amiga CD32, MS-DOS and SNES in 1993, and was developed and published by Flair Software. The CD32 version was bundled with the CD32 console on the same disc as the puzzle game Diggers.The player controls a character named Oscar through seven Hollywood-themed levels collecting Oscars. Osu!! Karatebu is an Action game, developed and published by Culture Brain, which was released in Japan in 1994. Another World, also known as Out of This World in North America and Outer World (アウターワールド Autā Wārudo?) in Japan, is a 1991 cinematic platformer action-adventure game designed by Éric Chahi for Delphine Software. The game tells a story of Lester, a young scientist who, as a result of an experiment gone wrong, finds himself in a dangerous alien world where he is forced to fight for his survival.Originally developed for the Amiga and Atari ST and later released for the Apple IIGS and DOS platforms, the game was widely ported to other contemporary systems. Later efforts resulted in several game engine recreations for the game that permitted it to run on modern computers, consoles and mobile phones. In 2006, Chahi independently released a 15th Anniversary Edition for modern computers, and a subsequent 20th Anniversary Edition five years later that adapted the game for numerous consoles and mobile computing platforms.Another World was highly innovative in its use of cinematic effects in both real-time and cutscenes, which earned the game praise amongst critics and commercial success. It also influenced a number of other video games and designers. Pierre le Chef is... Out to Lunch is a video game that was released for the Game Boy and SNES in 1993 by Mindscape. It was then ported to the Amiga and Amiga CD32 in 1994. Outlander is an action driving video game with a post-apocalyptic theme. It was developed and published by Mindscape in 1992 for the Sega Mega Drive/Genesis and in 1993 for the Super Nintendo.The game shares many similarities to the Mad Max film series, originally it was developed as "The Road Warrior" based on the Mad Max sequel, however near completion Mindscape lost the rights to the license and the title was changed to "Outlander".